Pop Stars is becoming a plant of choice of garden professionals and home gardeners alike because of its non-stop flower power and impressive and weather resistant garden performance. 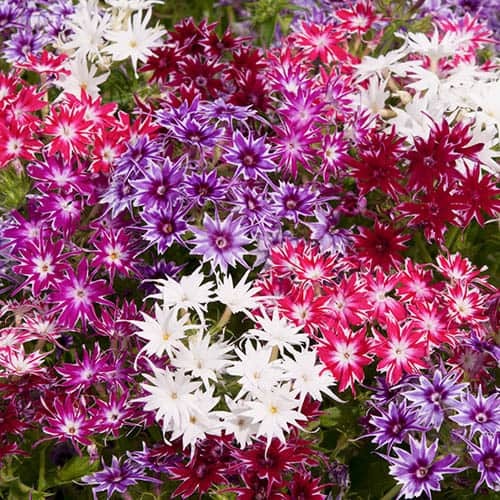 In full flower from May til October Pop Stars is the perfect choice for any patio container or sunny flower bed. The displays are 'self-cleaning' meaning the spent flowers fall freely so no fiddly deadheading is needed so very easy to grow..… Height 25 cm (10in). Like Bonfire Night in plant form… each star-shaped bloom will grab your attention like an erupting firework Pop Stars is becoming a plant of choice of garden professionals and home gardeners alike because of its non-stop flower power and impressive and weather resistant garden performance. Borne in tight clusters each brightly coloured bloom is intriguingly marbled giving plants a shimmering look. In full flower from May til October Pop Stars is the perfect choice for any patio container or sunny flower bed. The displays are 'self-cleaning' meaning the spent flowers fall freely so no fiddly deadheading is needed so very easy to grow..… Height 25 cm (10in).